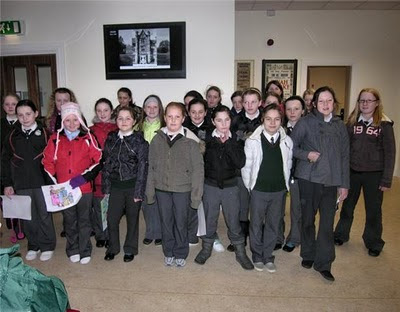 On Monday morning bright and early we had a visit from the girls from 3rd Class St. Mary's National School, Dungarvan, with their teachers Ms. Veale and Ms. Harty. They were doing research on the Famine and so came along to see our display. For a lot of the children this was their first visit to the Museum and they thoroughly enjoyed their visit. Our Education Officer, Tony, was on hand with some pictures for the children to colour. The handling objects and the display of toys were also a big hit.